SHANGHAI – The CITAB-CTBUH China Tall Building Awards Jury announced the winner of the inaugural China Best Tall Building Overall Award: Bund SOHO, Shanghai. 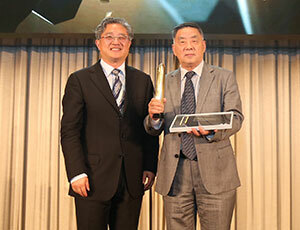 The winner was announced at the China Tall Building Awards Dinner & Ceremony, held at Shanghai Tower, on May 13. The final decision was the culmination of a juried selection process considering more than 90 entries from around the country. In February, the China Tall Building Awards Jury named four Excellence Award recipients: The Asia Pacific Tower & Jinling Hotel, Nanjing; Bund SOHO, Shanghai; Hongkou SOHO, Shanghai; and Wangjing SOHO, Beijing. 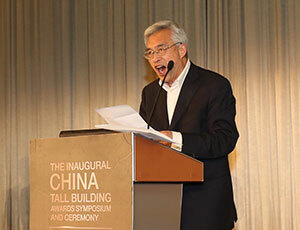 Chunhua Song, jury chair, announces the China Best Tall Building Overall Award winner. Senior representatives of each of the Excellence Awardees gave presentations at the Awards Symposium at Shanghai Tower, with the jury convening immediately afterwards to determine an overall winner. Jury Chair Chunhua Song, former vice minister of the Chinese Ministry of Housing and Urban-Rural Development, then had the honor of awarding the title of overall “China Best Tall Building” to Bund SOHO at an elegant Ceremony & Dinner held in the 5th-floor Garden Ballroom of the recently completed Shanghai Tower. 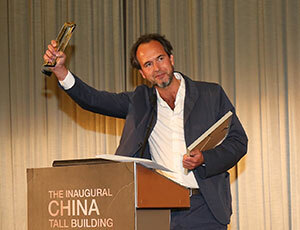 Stephan Rewolle, Associate Partner, von Gerkan, Marg and Partners Architects, accepts the China Best Tall Building Overall Award. In addition to the China Best Tall Building award, the China Tall Building Awards recognized and showcased projects in several other categories. Michael Greene accepted the China Urban Habitat Award for Jing An Kerry Centre, Shanghai, on behalf of architect KPF. Haiyan Qu, Deputy Chief Engineer of North Region, accepted the Construction Award (a category which is unique to China and launched with this year’s awards) for Shenyang’s Forum 66, on behalf of China Construction Steel Structure Corporation. The China Tall Building Innovation Award winners, Mega-Suspended Curtain Wall, were in familiar territory – the innovation is the key to the Shanghai Tower’s graceful flowing, twisting shape. Dr. Zhijun He, Chief Engineer, Technology Development Department, TJAD and Xiaomei Li, Vice President & Executive Director, Gensler accepted the award. The awards not only recognize projects. Of course, there would be no projects without the efforts of extremely talented and hard-working people. The inaugural China Tall Building Outstanding Achievement award went to Dasui Wang, Chief Engineer of ECADI and China Design Master. The CITAB-CTBUH China Tall Buildings Awards recognize projects and individuals that have made extraordinary contributions to the advancement of Chinese tall buildings and the urban environment, and that achieve sustainability at the highest and broadest level. Tall buildings can be polarizing presences in their cities, admired for their sheer height or skyline silhouettes, and criticized for their poor environmental performance and street-level experience. The object of this awards program is to provide a more comprehensive and sophisticated view of these important structures, while advocating for improvements in every aspect of performance, including those that have the most effect on the people who use these buildings each day. This often means that the buildings highlighted are often not the tallest in a given year, but represent the best qualities and innovations in the typology.